Jordan, a small country with limited natural resources, is situated geographically at the crossroads of regional instability, which is continuously affecting the country’s economy. Jordan is heavily dependent on subsidized Iraqi oil and remittances from expatriate Jordanians working in the Gulf. Additionally, Jordan suffers from a lack of agricultural land and it is the world’s fourth poorest country in terms of water resources, which underlies the government’s heavy reliance on foreign assistance. Given the chronic high rates of poverty and unemployment, the government has been challenged with inflation and a large budget deficit. Sandwiched between Iraq and Israel/Palestine Jordan received hundreds of thousands of Palestinian refugees who fled Palestine during the Arab-Israeli wars, mainly in 1948-1949 and 1967, and hundreds of thousands of Iraqi refugees after the 2003 American-led invasion of Iraq. 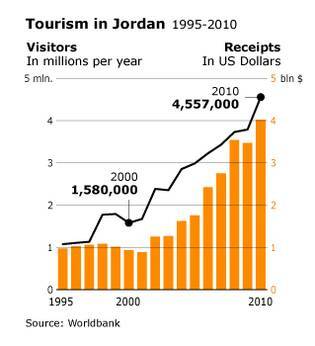 Jordan’s economy benefited at times from this influx. Jordan had witnessed deceleration in economic growth during last years due to the instabilities which the Middle East and North Africa region had witnessed generally. King Abdullah II, before the parliamentary elections which were conducted in September 2016, had declared the establishment of a council for economic policies; with the aim of specifying the necessary policies to revive the Jordanian economy, in addition to face the effects resulting from youth unemployment which surpassed 34.8%. Jordan had started to implement the commitments of the agreement “Jordan covenant”, among which is beginning to grant the Syrian refugees residing in Jordan work permits, simultaneously with the European Union lowering the conditions for rules of origin regarding a particular category of Jordanian products for 10 years. The Economic Outlook report which issued by the World Bank in October 2016 about Jordan emphasizes the importance of executing the agreed-upon implementations at the labour market level, improving the investment climate, and making room in front of obtaining funds, and that is with the aim of reviving economic activity and improving welfare. The gross domestic product (GDP) in 2015 had reached 37.5 billion US dollars, in comparison with 35.8 and 33.5 billion dollars in the years 2014 and 2013 respectively. The GDP per capita in 2015 had reached 4680 US dollars, in comparison with 4590 and 4420 in the years 2014 and 2013. It is predicted that the GDP growth rate will increase between 2017 and 2019 to reach 3.4% according to the World Bank. The International Monetary Fund predicts that the inflation rate will reach in the year 2017 to 2.3%. Jordan had occupied the 63rd rank on the Global Competitiveness Report between the years 2016 and 2017. Compared to other developing countries, Jordan’s infrastructure is well developed, with the exception of the railway system. A report of the World Economic Forum stressed that the country’s overall transportation, communications, power, and information technology – which are considered the backbone for strengthening any country’s productivity and competitiveness – were healthy. The same report said that Jordan’s infrastructure ranked 61st out of 139 countries, scoring 4.1 out of a possible seven points. Jordan’s roads ranked 44, port infrastructure 64, air transport infrastructure 35, electricity supplies 38, fixed telephone lines 100, mobile telephone subscriptions 68, and availability of the latest technology 49. The government is also working to improve its national railway services. The Jordan Times recently reported that the government has completed studies for a National Railway Network, linking Mediterranean countries, including Turkey, with the Persian Gulf through Jordan. The project is expected to cost about USD 3.4 billion. Economic experts argue, though, that there are more important priorities in the kingdom’s economy. Negotiations are also underway to establish the Amman-Zarqa light-rail line, which is intended to serve the two most populous cities in the kingdom; thousands of Jordanians wait for hours every day to use public transportation to shuttle between the two cities. The government issued tenders for this project in 2005, 2007, and 2009, but it has not yet materialized. In order to attract major international investment, the government is working to develop its infrastructure across the kingdom, including that which will serve major real-estate projects, particularly its transport sector, including the rail system, Amman’s Queen Alia Airport, and the port of Aqaba. Jordan has worked over the past decade to penetrate global markets, in the face of growing international competition. Globalization has provided developing countries such as Jordan with opportunities to access the markets of industrialized countries. According to the Ministry of Industry and Trade, Jordan has agreements with 59 non-Arab countries, including free-trade and investment-promotion and protection agreements with the United States; an economic and trade-cooperation agreement with Israel; a free-trade agreement with Canada; and an association agreement with the European Union (EU). 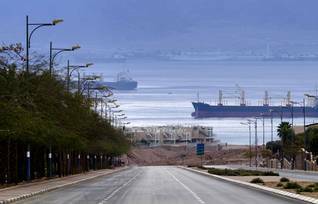 In April 2000 Jordan joined the World Trade Organization and made Aqaba a Special Economic Zone, where businesses enjoy tariff and tax exemptions. One of Jordan’s most competitive industries globally is the pharmaceutical industry, which is registered in more than 60 countries; about 75 percent of its production is exported. Other competitive industries in the kingdom include tourism, including medical tourism, telecommunications, and higher education. Despite intensive efforts to attract investment, however, Jordan ranked 71st in the Global Competitiveness Index of 2011-2012, falling 6 places from its ranking in 2010-2011. For an in-depth overview of Jordan’s energy sector click on the button below. The two most important sectors in Jordan’s development are industry and construction. Jordan’s industrial sector relies heavily on clothing, fertilizers, potash, phosphate mining, pharmaceuticals, petroleum refining, cement, and tourism. The CIA’s World Fact Book shows that Jordan’s industrial-production growth-rate was 2.7 percent in 2010; it was estimated at 1 percent in 2011. According to Jordan’s Economic and Commerce Bureau, the growth rates of Jordan’s construction sectors – which is 75 percent residential and 25 percent commercial – are expected to exceed 20 percent per year in the coming five years, due to Jordan’s growing population and business. 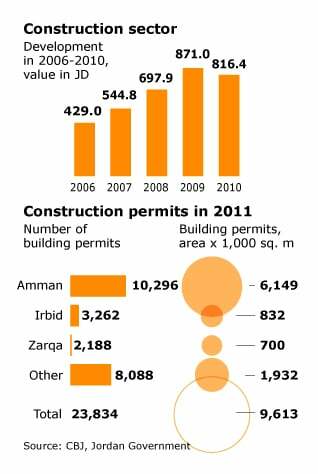 The number of construction permits issued in the kingdom in 2010 was 31,732, compared to 34,581 in 2009. Manufacturing, which contributes about 18 percent of Jordan’s GDP, includes the leather, chemical, footwear, plastics, and IT industries. Mining contributes 2 percent of GDP. Jordan’s industrial production rose to USD 2.9 billion in 2010, an increase of 4.7 percent from the previous year. Industrial investment decreased by about 9 percent in 2010, due to the decline in foreign investment (which benefits from the investment promotion law) to just USD 315 million, compared to USD 988 million in 2009. The industrial sector contributed about 24 percent to Jordan’s GDP in 2010. The Ministry of Industry and Trade expects this number to rise to about 25 percent in 2011. The value of industrial exports, which made up about 90 percent of total exports in 2010, increased by 16.7 percent, reaching USD 4.9 billion. The IT, engineering, and electrical-manufacturing sectors, which constitute 17.6 percent of total industrial exports, topped industrial exports in 2010, increasing 20.6 percent from the previous year. The number of industrial establishments registered at the Ministry in December 2010 reached 15,586. There was a total of about 186,172 workers in the industrial sector. This is about 15 percent of the total number of workers in Jordan. The manufacturing sector is the largest source of jobs in the industrial sector, creating over 6,000 jobs in the first half of 2010, mostly for Jordanians. Over the past decade, Jordan – especially Amman and the port city of Aqaba – has experienced a boom in construction. Large development projects, including new luxury hotels, residential projects, and commercial buildings, have begun to meet growing demand, especially after the influx of Iraqi and some Lebanese investors into the kingdom. After the American-led war on Iraq, many Iraqi investors moved to Jordan, where they started new businesses and bought houses for their families, in order to blend into the community. 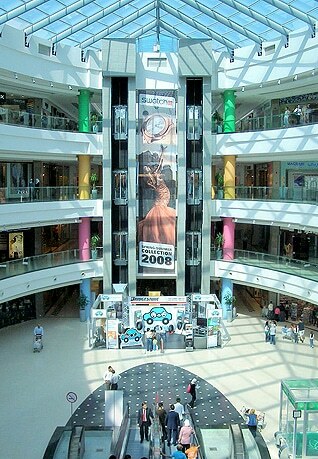 The growth of Jordan’s economy and the large number of young people also led to a high demand for residential and commercial development. Department of Statistics data show that permits were issued in 2010 for 8,488,000 square metres of residential construction, an increase of 6.7 percent over 2009, and permits were issued for 2,267,000 square metres of commercial construction, an increase of 8.7 percent over 2009. The same study showed that 78.9 percent of the permits were issued for residential projects and 21.1 percent for commercial projects. Currently, one of the largest construction projects in the capital is the Abdali Project, a new downtown for Amman. Built on a total land area of approximately 384,000 square metres with a built-up area of over 1.7 million square metres, the project will serve both Jordanians and foreigners. The project is valued at over USD 5 billion. About ten percent of the overall built-up area will be designated for hotels, 42 percent for residential use, 30 percent for offices, and 18 percent for retail. Also included are state-of-the-art roads – including intersections to ensure smooth traffic flow – and bridges. Important to the construction boom is the kingdom’s large supply of natural construction materials, such as building stone, and raw materials for concrete, including limestone for Portland cement, gravel, sand, and crushed rock. 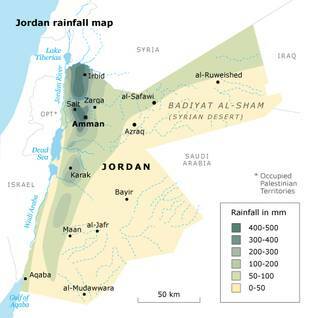 Jordan uses only a fraction of its land for farming, and the lands that are farmed rely heavily on rainfall, which fluctuates from year to year, for irrigation. Jordan’s total surface area is 89,000 square kilometres, of which only 5 percent is arable and only 80 percent of this arable land is used for agriculture. About 60 percent of Jordan’s agricultural production is grown in the Jordan Valley, a low-lying strip with a warm climate, fertile soil, and better water supply. Most of Jordan’s fruits and vegetables are grown there, as they ripen earlier than those grown elsewhere. The agricultural sector’s direct contribution to the kingdom’s economy is small, not exceeding 2.9 percent, but its indirect contribution, through its connection with the other sectors, is about 27 percent. Jordan has been encouraging the private sector to invest in agricultural production and trade, but the kingdom’s main problem, the lack of water, has taken its toll on its underground water resources and wetlands and on the Jordan and Yarmouk rivers. According to the Ministry of Agriculture, over 90 percent of Jordan’s land is considered arid, receiving no more than 200 millimetres of rainfall per year. Jordan’s lack of water has made it heavily reliant on agricultural imports to meet its needs. Jordan’s annual wheat production does not exceed 50,000 tonnes, and it must import 700,000 tonnes. The country’s production of olive oil varies from year to year, depending on rainfall. A recent study carried out by the Department of Statistics in cooperation with the Ministry of Agriculture showed that the country’s production of olive oil during the 2010 season – between 15 October 15 2010 and 23 January 2011 – increased by 37 percent over the same period in 2009. Jordan’s livestock market contributes about 55-60 percent of the agricultural sector. Mafraq and Amman Governorate breed the most livestock. According to the Ministry of Agriculture, this market has improved since the ministry made agreements with the Gulf countries, lead by Saudi Arabia, to open their markets to the kingdom’s livestock in October 2008. This encouraged livestock breeders to continue in business and reduce their losses caused by the global increase in barley prices. The government is currently negotiating with Lebanon to become its livestock supplier. 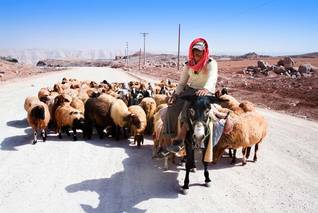 Jordan has 3 million goats and sheep, 13,000 camels, and 68,000 cattle. Poultry is also important in the country’s agricultural economy. Jordan exports livestock to Iraq, some Gulf countries, and Syria. Jordan’s trade sector is growing rapidly. Trade is increasing by the year, and special industrial zones have been established to boost trade even further. According to the Department of Statistics, Jordan’s national exports reached USD 538 million in January 2011, rising by 18.3 percent from January 2010. The country’s total exports in the same month reached USD 643 million. Imports reached USD 1.6 billion, an increase of 40.8 percent from January 2010. In 2010 Jordan’s national exports rose by 17.8 percent from 2009, reaching USD 5.9 billion, while imports increased by 7.2 percent to USD 1.5 billion. In 2010 the trade deficit reached USD 8.1 billion, an increase of 4.8 percent. 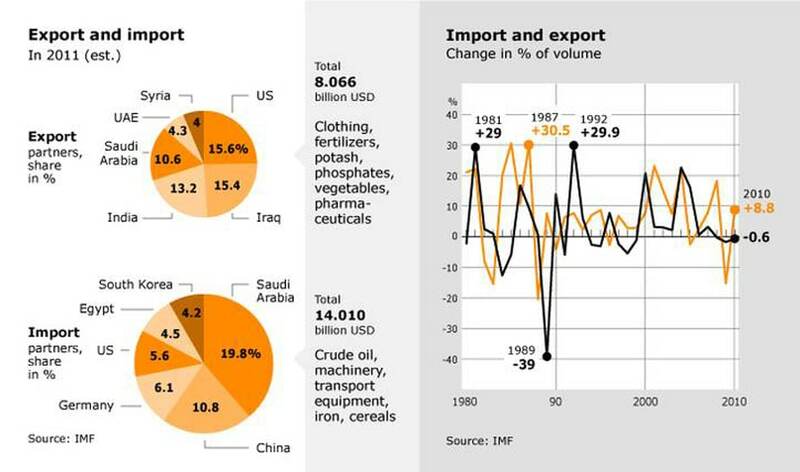 The main commodities whose export value increased in 2010 were clothing and clothing accessories, pharmaceutical products, fertilizers, vegetables, and crude potash. The value of exported crude phosphate decreased in 2010. The total value of certain imported items rose in 2010, including crude oil, vehicles, plastics, and iron or steel. The import value of machinery and electric equipment decreased. There was an increase in 2010 in trade to and from the Greater Arab Trade Zone, including Iraq for exports and Saudi Arabia for imports, particularly crude oil. There was an increase in exports to the North America Free Trade Agreement area, especially the United States, and there was a decrease in the value of imports from the same area. The government set up special economic-development zones in several governorates. The Aqaba Special Economic Zone (ASEZ) was launched in 2001 as a low-tax, duty-free area. These zones attract foreign investment, create employment opportunities, and enhance production. The country’s banking sector is growing and seems healthy. A study by Jordan’s Central Bank showed that there are 25 banks operating in the kingdom, after the introduction in 2010 of two new banks, the National Bank of Abu Dhabi and the Jordan Dubai Islamic Bank. There are currently three Islamic banks, thirteen commercial banks, and nine branches of foreign banks. Jordanian banks had 141 branches abroad in mid-2010. The foreign share in ownership of Jordanian banks increased from 36.6 percent in 2003 to 46.7 percent at the end of the first half of 2010. This reflects a growing faith in Jordan’s economy and banking system. 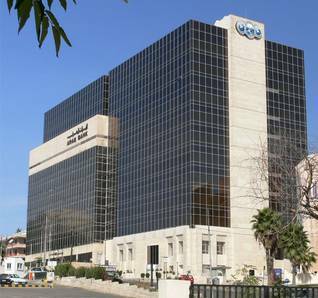 According to a study by the Banks Association in Jordan, the share of two of the three Islamic banks in the total assets of banks operating in Jordan rose from 7.6 percent in 2000 to 11.4 percent in late 2009. The share of total deposits held by those two Islamic banks increased from 7.3 percent in 2000 to 13.4 percent by the end of 2009. The study did not include the most recent Islamic Bank, Jordan Dubai Islamic Bank, which was established in 2010. The study also shows that the total assets of licensed banks by the end of 2009 was approximately 30.9 billion Jordanian dinars, distributed as follows: USD 33.3 billion for Jordanian commercial banks (77.1 percent of the total assets of banks operating in the kingdom), USD 4.9 billion for Islamic banks (11.4 percent), and USD 5 billon for foreign banks (11.5 percent). Ministry of Tourism figures show that the total number of visitors was about 8 million in 2010, up from about 7 million in 2009. About a million of those visited Petra, 400,000 Jerash, 160,000 the Baptism Site (see below), and 400,000 Mount Nebo, from which Moses purportedly viewed the Promised Land. Officials fear that uprisings in the region since the beginning of 2011 could damage tourism. At the crossroads of Asia, Jordan was on a route taken by merchants trading between East and West. Jordan has a rich history, having been home to civilizations of the Roman, biblical, early Islamic, and Crusader periods. Several sites bear witness to these civilizations, including the rose-red city of Petra, the Baptism Site, and the columns and Roman theatres of Jerash and Amman. According to the World Bank, Jordan managed over the first decade of the 21st century to achieve above-average development outcomes within its income group, despite grave tensions in the regional political environment. Under the joint 2006-2010 World Bank Country Assistance Strategy, the Bank has helped Jordan reduce its poverty rates and create more jobs. The strategy ended in 2010, and the Bank has since then been preparing a new version of the Country Partnership Strategy of 2011-2014, which will focus on the need for continuing strong analytical work and technical assistance with Jordan’s development. After the fall of the Egyptian regime of President Hosni Mubarak in February 2011, the Gulf Cooperation Council (GCC) – a group of states bordering the Persian Gulf – recently invited Jordan and Morocco to join that wealthy club of monarchs, but no details were provided on the nature of the membership nor an exact date for it. The estimated 2011 deficit in the USD 8.9 billion state budget was USD 1.6 billion, while the overall public debt during the first quarter of this year was USD 16.89 billion, which is about 58 percent of GDP. In 2010, the budget deficit was USD 1.5 billion, compared to 2.1 billion in 2009. The Ministry of Finance reported that public debt increased by 18.6 percent in 2010 to USD 16 billion from 13.5 billion in 2009. Jordan’s public debt was 61.4 percent of GDP in 2010. 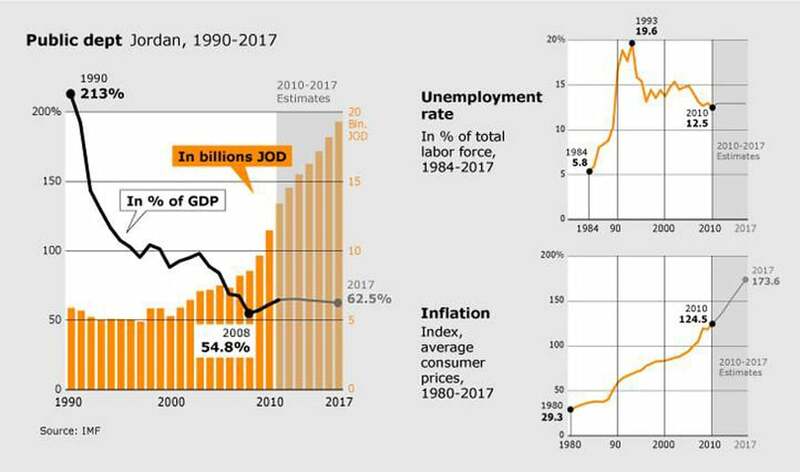 Figures from Jordan’s Central Bank show that the country’s GDP growth-rate reached 3 percent in 2010, and GDP was estimated at USD 27.5 billion. The inflation rate was 5 percent. According to the Department of Statistics, the main reason for the high inflation rate was the increased costs of transportation (12.7 percent), rent (3.8), meat and poultry (6), vegetables (12.9), tobacco (12.1), and education (6). The unemployment rate was 12.5 percent in 2010. Central Bank figures also show that per capita GDP, at current market prices, was USD 4,500 in 2010, and the Central Bank’s foreign reserves at the end of 2010 were USD 12.2 billion. High taxes imposed by the government, including income and sales taxes, as well as the need to obtain permits from agencies such as the Ministry of Interior and the Intelligence Department have pushed many underprivileged people into the informal sector, as they do not want to license their businesses. Under Article 16 of the Income Tax Law of 1985, income is taxed at 25 percent on income generated from services and 15 percent on income generated from industrial activity. The sales-tax rate is 16 percent of the value of the goods or services sold; this increases the cost of goods and services and weakens the competitiveness of local traders in the local markets. The informal sector involves many unregistered workers who did not receive the proper training and do not benefit from social security and health insurance; such workers are not protected by labour laws. Although there are no official figures on the size of this sector, economists believe that it generates about 20 percent of GDP and employs 25 percent of workers in the country. 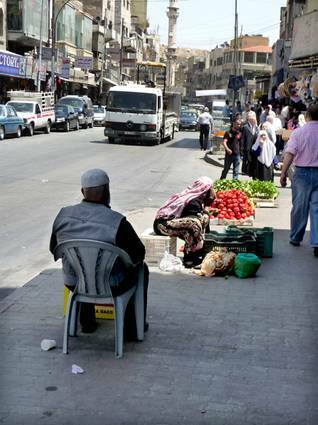 According to a study carried out in November 2007 by al-Urdunn al-Jadid (New Jordan) Research Centre and the United Nations Development Programme (UNDP), it probably involves street vendors, people working from home, and some temporary workers. Women and children are thought to be a large percentage of the informal sector, as are non-Jordanians, including Egyptians and Iraqis, who do not hold residency or work permits. Some domestic workers are also part of the informal sector, as they are not registered with the government. The Ministry of Planning, in cooperation with the UNDP, planned to carry out a study in 2011 on the size of the informal sector in the kingdom, the number of its employees, and its contribution to GDP. Jordan has sought for several years to upgrade its twelve governorates and their cities, in order develop the whole country and improve the living standards of all its residents. Successive governments have tried to increase development and economic opportunities beyond the capital, Amman, where the main businesses and most of the construction projects are concentrated. In 2008, the government identified 22 so-called ‘pockets of poverty’ and directed efforts to improve the lives of the residents of those areas. The central government has also been working, through decentralization, to allow local governorates and municipalities and their residents to play larger roles in decision-making and in the sustainable-development process in their regions. International grants have been applied to this particular goal. The Ministry of Planning in 2010 managed to increase international grants to Jordan by 12 percent, to USD 782 million, while the total value of international grants and loans reached USD 1.1 billion. About 30 percent of this assistance was channelled into water supplies and sanitation, 25 percent into power, 6 percent into health, 6 percent into education, 5 percent into economic development for Jordanians, and 2 percent into local development and the fight against poverty. In cooperation with donors, the ministry is considering several possibilities for combating unemployment and improving the state of the governorates through a funding mechanism that attracts national investment to fund small and medium-sized projects throughout the kingdom. The Ministry is also working on providing funding for large projects undertaken by the Jordanian and international private sector. With the assistance of the EU, the ministry established development units in some municipalities in 2009 and trained local staff in directing development programs. The same program included eighteen development projects and an increase in the investment in economic and social services. The Ministry’s programs also attempted to increase the participation of young people and women in local elections, whether municipal or parliamentary. The government has also encouraged voluntary work, including that of women, in municipalities, to make development plans and ensure that they are implemented. Also in 2009, the government established a special-incentives fund for municipalities that collected over USD 5.7 million, which was used to fund construction projects and buy machinery. In 2010, the ministry, in cooperation with Columbia University, established a sustainable-development institute that was the first of its kind in the kingdom; its purpose is to train local workers in development, the fight against poverty, local capacity building, and decentralization. Europe donated USD 4.2 million to support the development in the municipalities in 2010. In the same year, 330 small-scale projects were funded in poverty pockets, while funding for six hundred other small projects was made available for the second stage of the program. The government continues to support the construction of schools, water and sanitation projects, and road construction throughout the country. According to Jordan’s Department of Statistics, the public and private sectors created 26,000 jobs in the first half of 2010, 19,000 of which were filled by males and 7,000 by females. The private sector was the largest creator of jobs in that period, accounting for two-thirds of the total, while the public sector created 26 percent. Most of those new jobs (22,000) were taken by Jordanians, and 84 percent went to single workers. The Ministry of Labour’s annual study for 2009 showed that unemployment reached 10.3 percent among males and 24.1 percent among females. Jordan is an importer and exporter of workers. Jordanian teachers, nurses, and others work in many countries, especially the Gulf States. The country relies heavily on its foreign labour force, which Jordan began to employ in the early 1970s. 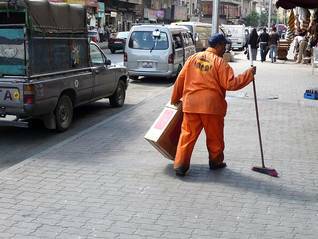 These workers dominate sectors in which Jordanian nationals do not wish to work, including construction, agriculture, and services. According to the Ministry of Labour’s annual study for 2009, foreign workers account for 23.9 percent of Jordan’s workforce; an estimated 76-81 percent of those foreign workers were registered. In the construction sector, Jordan relies mainly on Egyptian workers, who made up 71 percent of the total foreign workforce. Indonesian workers made up 8 percent (largely female domestic workers), followed by Sri Lanka (6.2) and the Philippines (4.3). Jordan also employs foreign workers in its Qualified Industrial Zones, joint Jordan/American/Israeli projects that have been established in ten different areas and are run by both the public and private sectors to produce goods that are exported to the United States.